INDIANAPOLIS — Remember those cartoons of yore when Bullwinkle tells Rocky he’s going to pull a rabbit out of his hat? 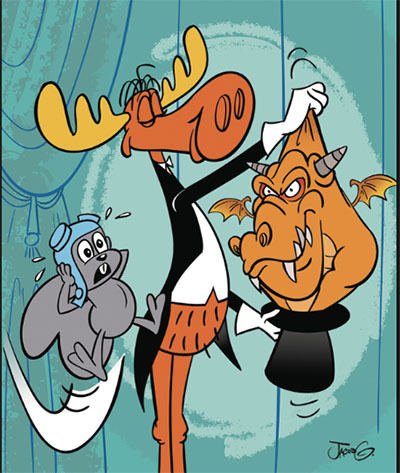 Except, sometimes instead of a rabbit, Bullwinkle ends up pulling out a scary creature. House Ways & Means Co-Chairman Todd Huston appears to be this session’s Bullwinkle. Out of the blue last month he came up with a $100 million relocation fee to move one of the Gary casinos to Terre Haute. And then after a committee hearing this week, it became $50 million. A either level, none of this was on the table when Spectacle began talks to purchase the two Gary casinos and in subsequent talks with the state to move one of them south. The IBJ reported that if Spectacle does proceed with the new Gary casino, the second license would be surrendered to the state and essentially dormant. Any future use of that license would require approval from the Indiana General Assembly. The bigger picture, of course, is that the original proposal was to help cash-strapped Gary set up a new intermodal port in Buffington Harbor by moving the casinos, and cash-strapped Terre Haute would get a casino. If Spectacle were to just walk away, perhaps the top hat will end up filled with eggs. Indiana Senate Republicans are set to advance a state budget plan that will show whether they’ve found more money to boost school funding (AP). The Senate Appropriations Committee is scheduled to vote Thursday on sending its version of a proposed two-year budget to the Republican-dominated Senate. School funding would increase by just over 2% each of the next two years under a proposal approved in February by the Indiana House. Gov. Eric Holcomb and GOP legislative leaders have touted the importance of addressing Indiana’s lagging teacher salaries , but education advocacy groups estimate a 9% funding increase is needed to boost average teacher pay to the midpoint of Indiana’s neighboring states. SB 198 - Makes substance abuse on penal or juvenile facility property an enhancing circumstance. HB 1029 - Assigns committee to study issues consumers face regarding prescription drug pricing, access and costs. HB 1051 - Assigns a study committee to look into reckless homicide. HB 1053 - Specifies new elements for a new design of the disabled Hoosier veteran license plate. HB 1057 - Allows a Vanderburgh County circuit court judge to appoint an additional magistrate. HB 1080 - Makes a correction concerning the deprivation of earned good time credit for inmates placed in a community corrections program. SB 004 - Establishes storm water management task force to study storm water management systems. SB 191 - Specifies “person”includes nonprofits for purposes of the historic preservation adn rehabilitation grant program. SB 271 - Eliminates state requirement that manufacturers must include certain information on an e-liquid container. SB 324 - Requires BMV to design a parking placard designating a person who has been deemed eligible to receive a disabled Hoosier veteran plate. SB 375 - Notes after June 30, 2019, local government may not enact an ordinance requiring a solid waste hauler to collect solid waste management fees. SB 545 - Requires executive director of Indiana public retirement system and the trustee of the Indiana state police pension to report to the committee overseeing stress tests or sensitivity analyses. SB 632 - Requires ISDH to distribute best practices for managing indoor air quality at schools. A controversial lending bill that narrowly passed out of the Senate is on its way to the House floor with a few changes. The amendments approved in committee Tuesday were not released until an hour prior to the meeting (Horton, Indiana Public Media). The House Financial Institutions Committee took no public comment on the bill, which changes rules for high-interest, short-term loans. One of the amendments lowers the interest rate cap for loans of less than $3,000 to meet the state’s 72% rule. And while the cap was lowered to 167% on loans requiring no collateral, that number is still well above what’s outlined in existing law. Rep. Matt Lehman (R-Berne) contends these new loan options are needed. “All this bill does is now to create a middle product,” said Lehman. The House committee voted along party lines, 7-3. Senate lawmakers this week approved legislation that aims to sharpen state law surrounding animal cruelty.But the measure doesn’t go as far as its author originally wanted (Smith, Indiana Public Media). The original legislation created broader definitions of animal cruelty and increased the criminal penalties for abusing animals. Rep. Ryan Hatfield (D-Evansville) says it’s important to give law enforcement the tools they need to go after animal abusers. “What we know about animal crimes, without a doubt – people who abuse animals, abuse people and they abuse children,” Hatfield says. But Senate lawmakers worried that the increased penalties weren’t proportional to crimes against people, so they stripped out those provisions. A new amendment approved by lawmakers Wednesday would allow projectiles to be used during school active shooter training, if employees consent in writing beforehand. The amendment is part of a bill that funds teacher firearm training (Barrett, Indiana Public Media). The proposed change comes in response to an incident at an elementary school in Monticello, Indiana earlier this year, when teachers were injured after being shot with metal pellets. Sen. Jeff Raatz (R-Richmond) proposed the amendment to allow for projectiles. He says it should be an option for this type of training. “It’s got to do with reality, and making sure they experience the emotions and the adrenaline and everything that happens during the training, but it’s not required,” Raatz says. Raatz says training participants at the Monticello school were notified beforehand about the use of metal pellets. This contradicts what one teacher from the school told WFYI, that employees were unaware they would be shot during the training. Both bills move now to the full Senate. When Samantha Hogue-Figgs’ daughter died in a factory accident last year, the company received only a $6,300 fine. That’s why she traveled to the Statehouse on her birthday Wednesday to watch the Indiana Legislature give final approval to a bill stiffening penalties for businesses in workplace deaths (Kelly, Fort Wayne Journal Gazette). Rep. Martin Carbaugh, R-Fort Wayne, brought House Bill 1341 to reform how Indiana addresses negligence by an employer that contributes to an on-the-job fatality. “It’s shocking to me that we have even one company removing vital safety features from a piece of equipment,” Carbaugh said. “This tragedy resulted with the death of a young, vibrant woman and could have easily been avoided. That’s the really frustrating part of all of this.” HB 1341 increases the penalty for an employer that knowingly violates safety code that results in an employee’s death. The new maximum penalty would be $132,598, nearly double the current $70,000 standard. The House voted 94-0, which now goes to Gov. Holcomb.